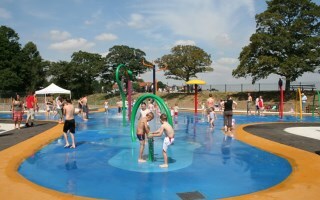 This fantastic children's water park is located in The Valley at the centre of Promenade Park. Opening times are subject to weather conditions, cleaning and maintenance requirements. We suggest you check the Splash Park is open before travelling. PLEASE NOTE. WE DO NOT ACCEPT CREDIT CARD PAYMENTS ONLINE. IF YOU WISH TO PAY USING A CREDIT CARD, PLEASE CALL 01621 856503 TO ARRANGE YOUR BOOKING. Please select the day you would like to visit. The water in the Splash Park is chemically treated with sodium and bisulphate sodium hypochlorite. There is possibility of an allergic reaction so always test the water on your child's skin before they enter the water play area. Please ensure that you only film or photograph your friends and family. The water used in the water sprays is stored in a huge underground tank and is monitored and regulated by a computer controlled system. The health and well-being of all visitors is a prime concern and park staff are on hand to help minimise the risk of injury or infection. With large numbers of children playing together, infection can spread quickly. Do not bring an unwell child to the Splash Park - especially if they have experienced diarrhoea or vomiting in the previous 48 hours. Waterproof dressings should be used to cover any cuts, grazes or verucca's and children should be protected from the sun with a high factor sun cream. All accidents in the Splash Park should be reported to first aid staff immediately. Should any child have a 'little mishap' the facility could be closed for the rest of the day for cleansing purposes - please help us reduce the risk. Dogs are not permitted in the Splash Park or within the surrounding fenced play area.